One of the best parts of living in Texas comes every Spring when the bluebonnets and other Texas wildflowers pop up alongside the highway and in random fields. The beauty lasts for only a few weeks but when you see them, you know Spring has sprung! It's a societal norm in Waco to drop off your children in a random field, place them among the flowers and to tell them to say "cheese". So, we did it this year just like we have almost every year since we've been in Waco. 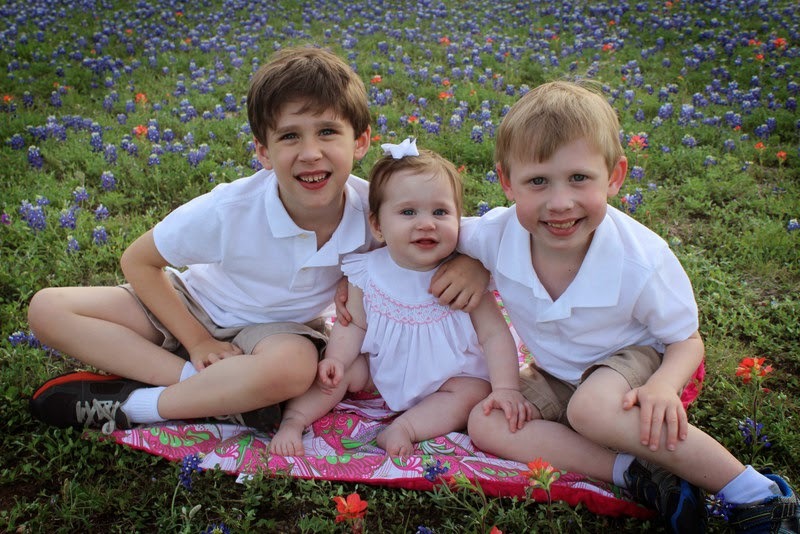 Here are this year's pictures and, if you keep scrolling, you'll see how much these nuggets have grown. First of all, Bennett has blueish green hair these days. It's starting to fade but after asking consistently for at least a year to dye his hair, I finally relented, shortly after family photos were taken. Santa brought Bennett semi-permanent hair dye. The directions said it would wash out in anywhere between 5-25 washes. 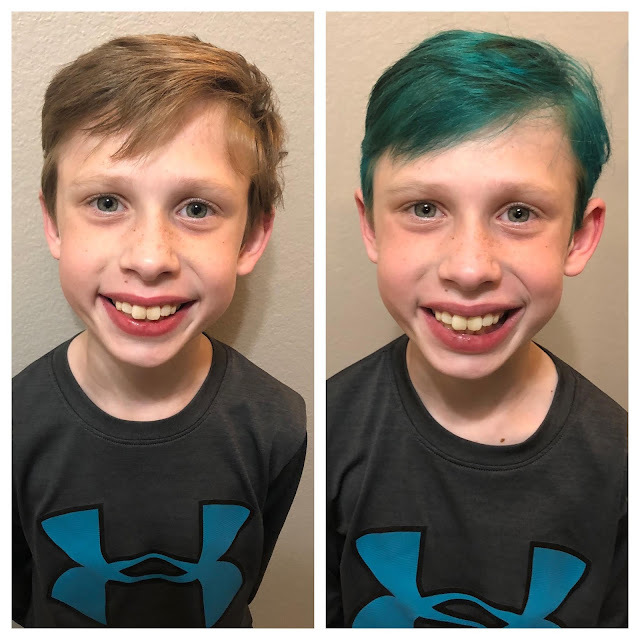 What the directions didn't say is how often a 9 year old typically washes their hair when they don't want the dye to come out. Ha! On one hand, I'm so glad I finally gave in to his very simple request. A friend of mine made the point that allowing him to change his hair color was a great way to give him control over his body, which I hadn't thought about but I agree. Last week, Bennett went to see his CF Team at Dallas Children's Hospital for his quarterly CF appointment. 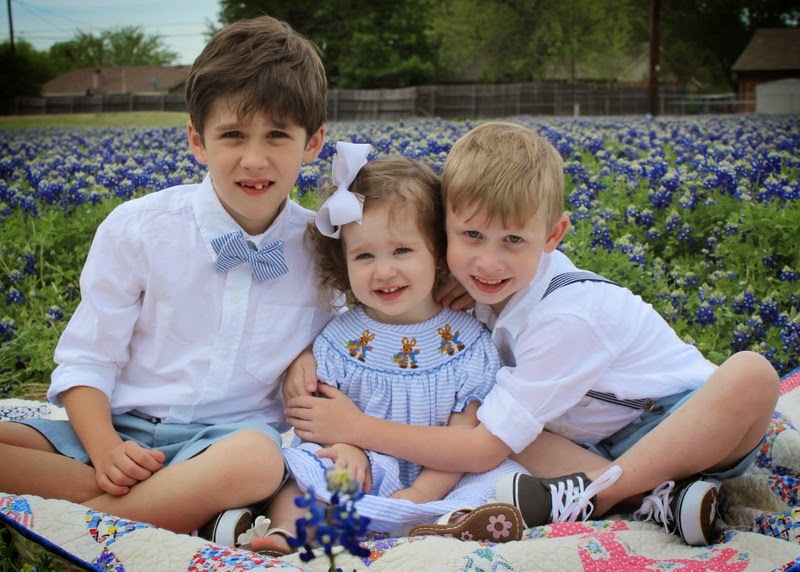 Bennett gained two pounds in 3 months so his GI doc was very happy. Gaining weight is very difficult for people with CF. We are currently giving Bennett 3 tube feeds daily, that's over 1500 calories and he's eating on top of that, which is wonderful. His ability to gain weight is a good sign he is staying healthy. He's still low in BMI so he needs more calories and more weight gain. But, for now, he's at least on track with his growth. Bennett's lung health is also looking good. His PFTs were 92%, down from 95%. But, considering that he hasn't gotten sick this winter so far, his Pulmonologist gave a good report and said his lungs sound good. Bennett's throat culture results shows he continues to be free of psuedomonas and MRSA, for now. We're starting back up nasal rinses and Flonase due to headaches, which may indicate sinus build up. But we are hoping we can hedge that off early. Bennett is doing well in school. This picture shows him sitting next to the board he made to demonstrate his work in robotics. You can see he's wearing his feeding bag. Bennett is very open about his CF at school. He sorta has to be open, considering he requires a tube-feeding each day at lunch. We are grateful that the school is more than willing to help us daily keep him on track with his weight gain! Oliver and Bennett (and most recently, Avonlea) started a new school this year and it's going super well. They are growing in incredible ways. Acton Academy is a bit of a blend of homeschooling and a gifted/talented program. Their school is very hands-on and self-directed, which requires a lot of motivation to learn on their part. Thankfully, since the school has designed the learning process to be so much fun, my kids have very little problem with motivation. In fact, they beg me to drop them off at school at the first possible moment and to pick them up at the very last moment of the day. Their school year is split in to 7 different sessions. In addition to the core subjects of Math, Reading and Writing, each session at school has a project-based focus. During the first session, they focused on entrepreneurship. Their second session was focused on learning about Ancient Greek culture. Their third session was all about Robotics. Their current session is about Plants and Gardening (they were making plant cell models out of Play-doh earlier this week). As naturally awesome as this session is, gardening at school has presented challenges for Bennett due to CF. Many of the bacteria, yeast, molds and allergies that Bennett's CF lungs are susceptible to getting live in soil and decaying things. These bacteria, yeast, molds and allergies can easily get kicked up into the air when dirt is moved around. And Bennett can easily breathe in these tiny particles into his lungs, which can cause havoc in his body. 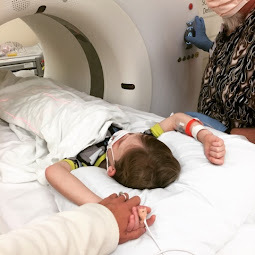 If and when Bennett gets a bacteria in his lungs, it will likely require weeks on IV antibiotics and/or inhaled meds and may include weeks in the hospital. So, we are very hesitant to risk this happening. I hated having to explain to the teachers (who are actually called Guides at Acton) that Brian and I believe there's no amount of playing in the dirt or near the dirt that is good for Bennett. Out of abundance of caution, we also don't let Bennett play outside when the lawn is being mowed, either. 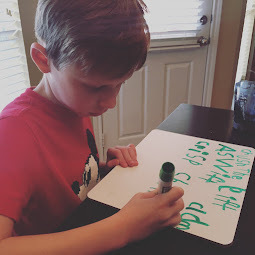 Not all families with CF believe it's necessary to withdraw children's playtime in the dirt - "children with CF shouldn't live in a bubble" is often an argument - but, based on what we know about the risks, Brian and I feel more comfortable letting him learn a bit more hands-off during this session. It's disappointing that Bennett can't play in the dirt. But, we reason that we work too hard to keep him well, to do something that we know has a risk to undermine all of the work we've done so far. I'm thankful that the kid's school partners with us and is willing to do whatever it takes to keep Bennett's lung health optimal for as long as possible. 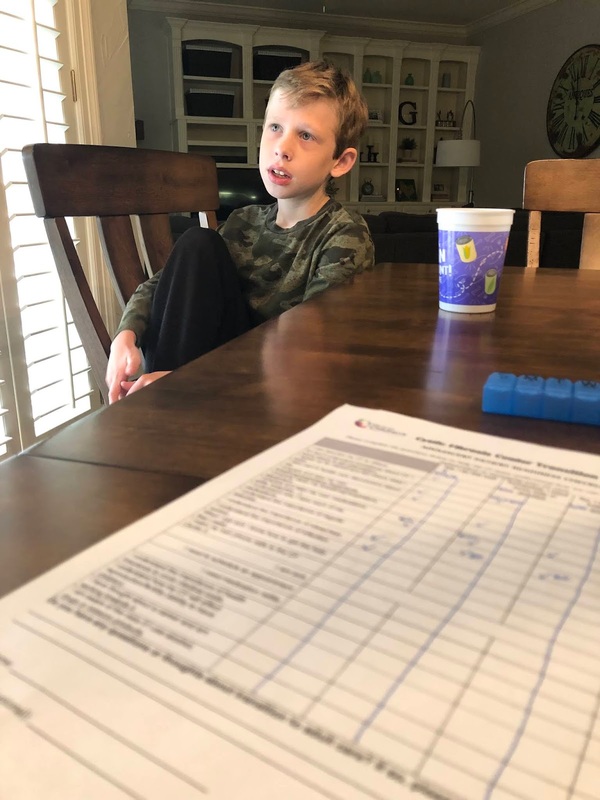 The last thing I thought I'd share is that we just started Bennett in twice-weekly sports training class for 7-11 year olds to see if he can improve some of the issues that showed up on Bennett's most recent physical therapy assessment. Although this new sports training class is an added expense and means "one more thing" to Bennett's week and our family's schedule, we are trying to focus on Bennett's long-term health goals and believe that doing so will, not only build his core muscles and improve his lung health, but also teach him that being physically active is caring for himself. Thankfully, Bennett really enjoys working out and has made new friends. A new friend said to his mother other night about Bennett; "he's a lot of fun." I'm so glad to have received a good report on Bennett's health and to breath a sigh of relief for another 3 months. Brian and I are incredibly proud of Bennett's resilience and his willingness to try new things! NACFC didn't feel quite so overwhelming to me this year since this was my third year to attend. I was more familiar with the format, the expectations, the pace of sessions. But, there was a moment that took my breath away when I least expected it to. It was during Plenary 2. I was sitting in the middle of literally the hugest auditorium I've ever been in. I was listening to the newest information about CF research. A picture of a little baby came up on the screen (see what I'm talking about here at the 53:35 mark). 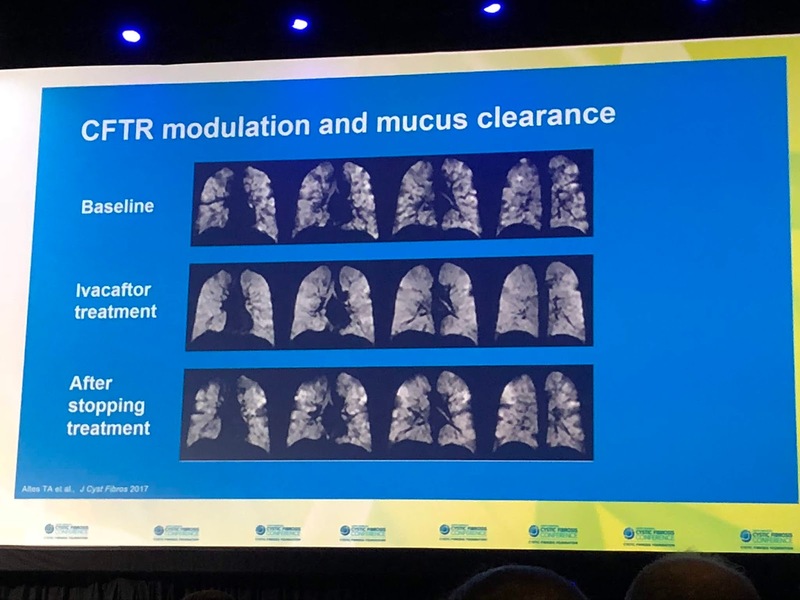 NACFC Speaker Dr. Felix Ratjen had spent the last hour explaining all the success we've seen with the newest CFTR modulator medications and wondered outloud, "how about if we start [these meds] early on in babies, in patients, before the lungs are damaged?"" 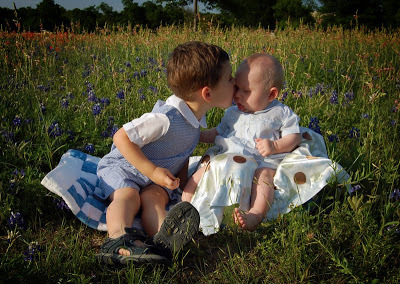 What if we give newborn babies, still yet free of CF damage, the newest CF drugs available? It was a hopeful statement. 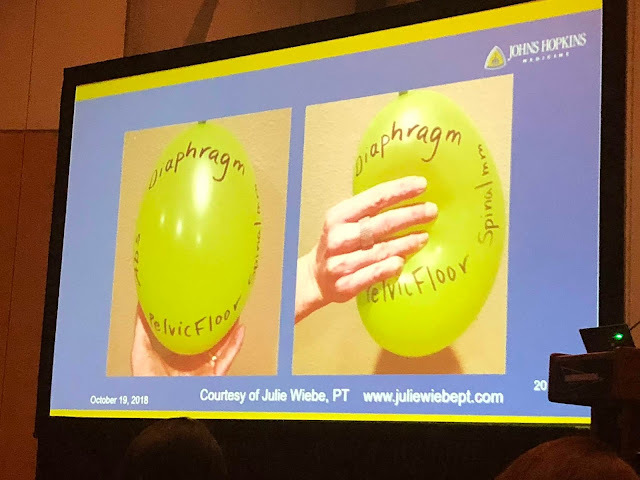 Suddenly, I had this flash of memory to the previous plenary, Plenary 1, held the night before, when speaker Dr. Lisa Saiman shared other new clinical information in CF by juxtaposing where we were in CF research the decade before. "Ten years ago..." Dr. Saiman would end up saying over and over again as she explained how much CF meds have changed in a decade. As Dr. Saiman flashed back to the decade prior, I couldn't help but do so in my own life. 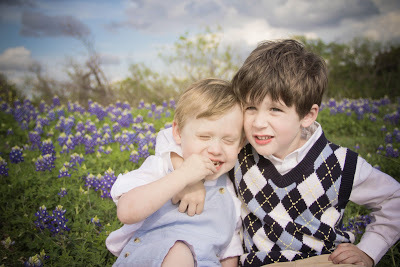 It was almost 10 years ago that Bennett was born (he just turned 9). At the time, Brian and I, new CF parents, eagerly listened to and read the newest CF research with expectant hope. 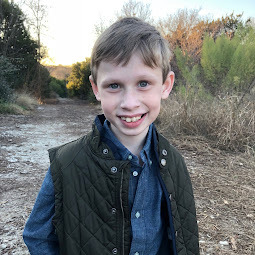 At the time, we felt very encouraged by the newest research and genuinely hoped that the newest meds available 10 years ago would prevent CF from damaging his body. And yet, back in the present, it's hard to believe that research is 10 years ago old and no longer relevant. Pulmozyme, a medicine that we use routinely nightly in our house (and have for years), had only barely been out of trials and become FDA approved when Bennett was born. 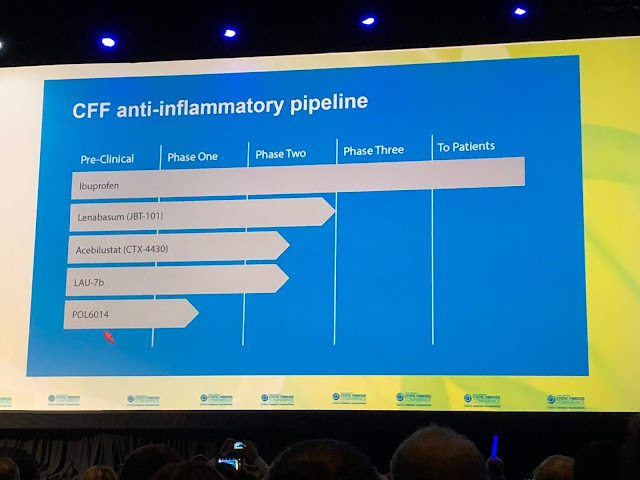 It felt "new" and "exciting" and now, it's commonplace and part of the standard CF protocol. I looked up again at that picture of the cute newborn baby up on the screen and re-heard the words "how about if we start [these meds] early on in babies, in patients, before the lungs are damaged?" All of the sudden, that idea no longer gave me hope. It brought me grief. "We're losing years!" I felt some deep place in my heart call out. "We've already lost a decade!" No longer is my family in that group of CF families who are"newly diagnosed." Our family isn't even in that group of families with "young children with CF" anymore. We're in a new place, a wonderfully joyful place for most parents: a place with a tween! But, when it comes to CF, time often passes faster than research can answer questions and faster than medicines can be approved. So, while birthdays in CF are a really big deal because they are a huge gift that we celebrate, they also mark time that has passed without a cure. Bennett is in a really good place, considering. He has had very good lung health compared to many children with CF. But we know silent lung damage is happening and we know that, statistically, he's losing 2% of his lung capacity per year. More drugs are coming. It's a very exciting time in cystic fibrosis. But it's a hard pill to swallow that we've also lost nearly 10 years of potential benefit for those drugs. Sitting in the auditorium, surrounded by a sea of professionals quietly listening to the newest information on CF, I felt time compress. But we won't be the lucky ones with newborns. We won't be the lucky ones with young children. Fingers crossed, in another few years, we'll be the lucky ones with an older child. But I want those early years back. I want to be the one with the newborn who benefits. And I want to stop the clock until we have more tools in our arsenal. Might this be what it feels like for those who have gone before me - parents of adults with cystic fibrosis - whose time compression is marked by many more FDA approvals of CF medicines...or, worse, are marked by the time when there were no new CF medicines at all? 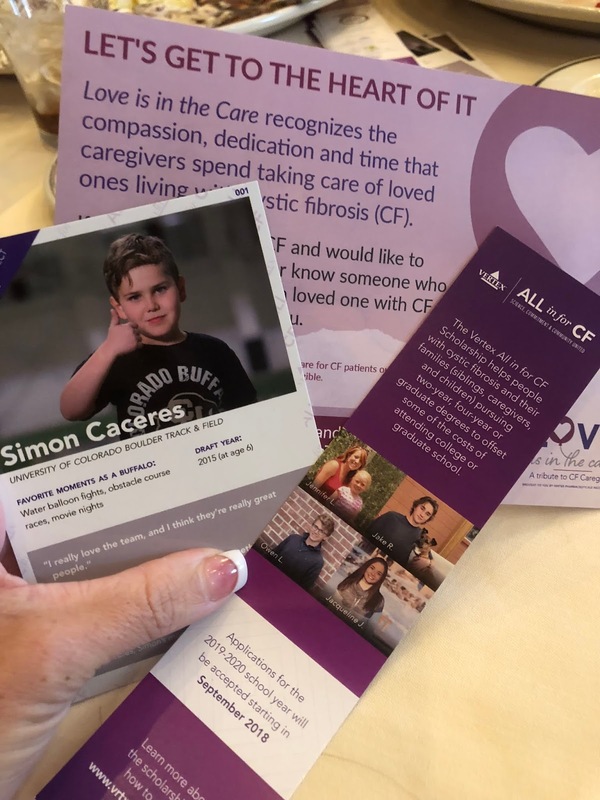 How difficult it must be for them to hear of the excitement in the CF community and yet to know their child, whom they've had to say goodbye, will not benefit? My heart breaks for them. And it breaks for us, all of those with CF still suffering from this awful life-threatening disease. Can I be sad for time lost, even as I have hope for the future? As a mother, I can hardly help but wanting Bennett to have never suffered. This is a very very good time for the CF community. 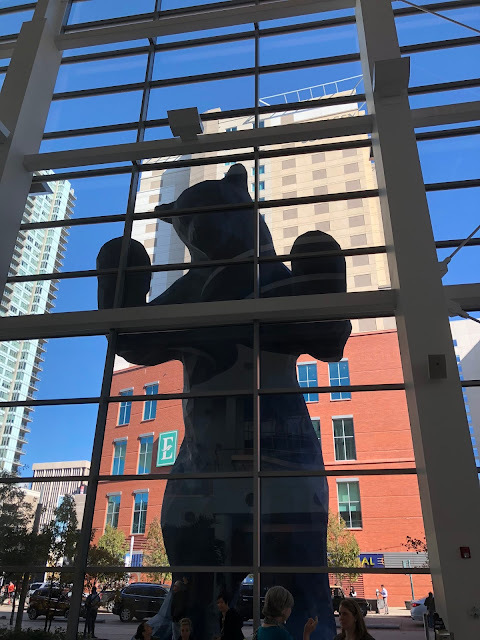 I just returned from being in Denver, Colorado for the 2018 North American Cystic Fibrosis Conference, an annual conference with more than 5,000 scientists, researchers, clinicians, parents and people with CF in attendance this year. I wanted to do a "brain dump" blogpost so I won't forget all that I learned during my few days there (this post). But I also wanted to reflect on some inner thoughts that emerged while I was there (next post). For the first time ever, Brian came with me this year (we tried to steal away some time for a very rare weekend getaway for ourselves). 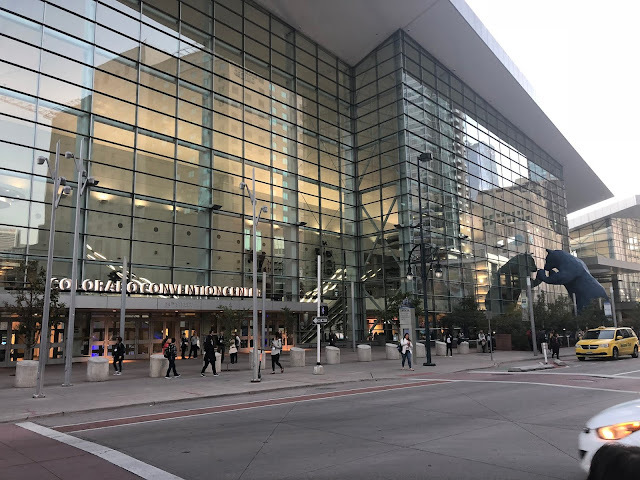 Brian was able to attend a few of the microbiology sessions and report back what he learned. The most important point I should share (something have to remind myself each year) is that, in many ways, CF research is moving fast and, in other ways, CF research is slow. 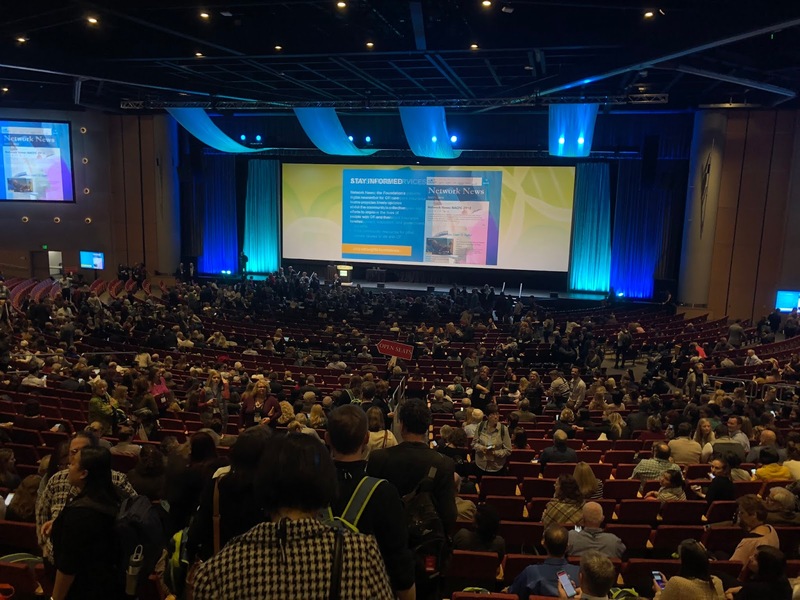 Most of what we learn at NACFC each year, for the most part, isn't necessarily "groundbreaking" or rather, it doesn't often translate in to an immediate behavior change in CF Care. But, taken in totality, it is helpful to learn to better understand the research trends and to get an idea of what is coming down the pipeline. 1.) Next year is gonna be a big year for cystic fibrosis! Probably the biggest news was announced during the first Plenary. 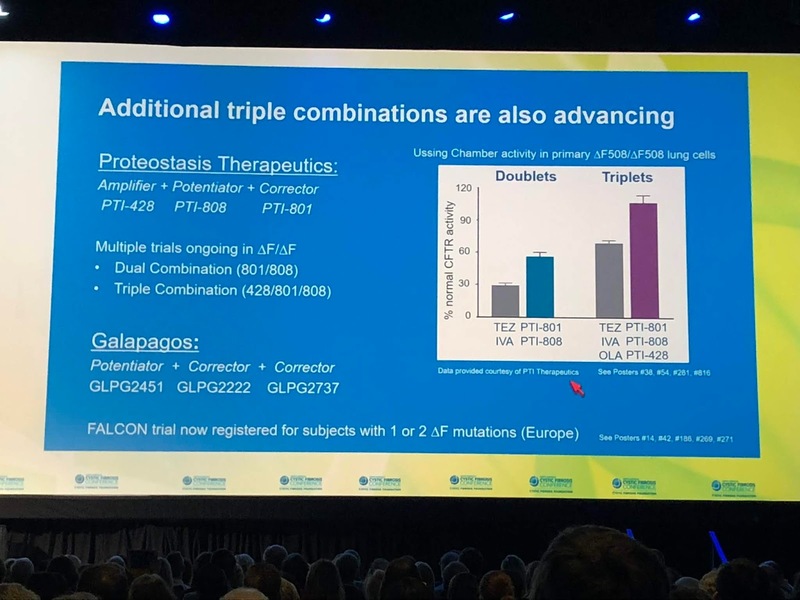 We are likely less than one year away from the announcement of the "triple combo" - a Vertex drug (a combination of three drugs) that could benefit up to 90% of the CF Community (those who have 1 copy of the F508del). We know that the "Triple Combo" drug is highly effective in people with a single copy of F508del. 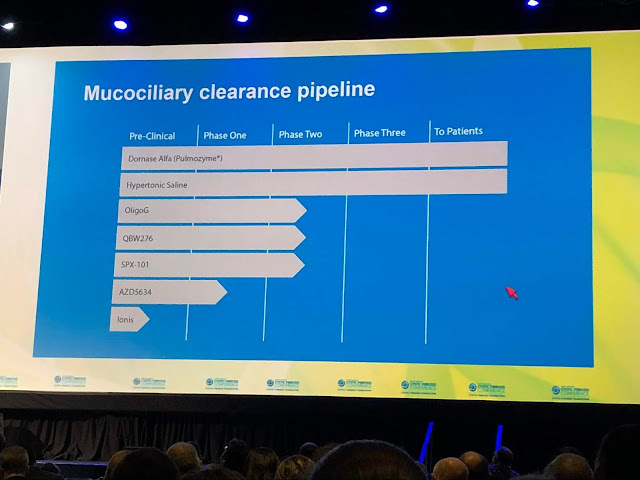 Phase II data results came out in February 2019. Both VX-659 + Tezacaftor/Ivacaftor and VX-445 + Tezacaftor/Ivacaftor achieved similar results. 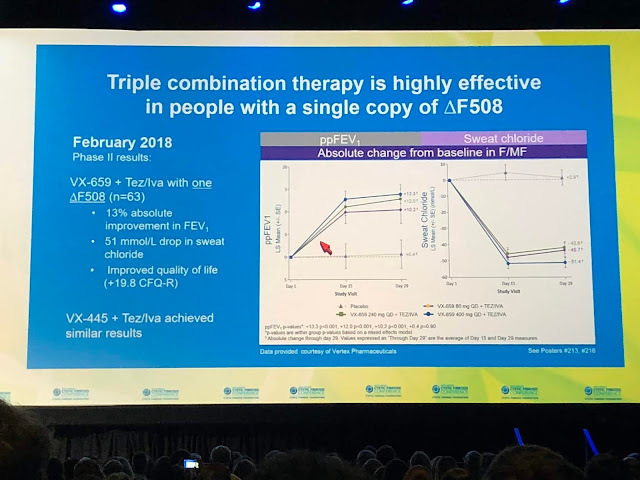 Data on the VX-659 trial should be available in late 2018. 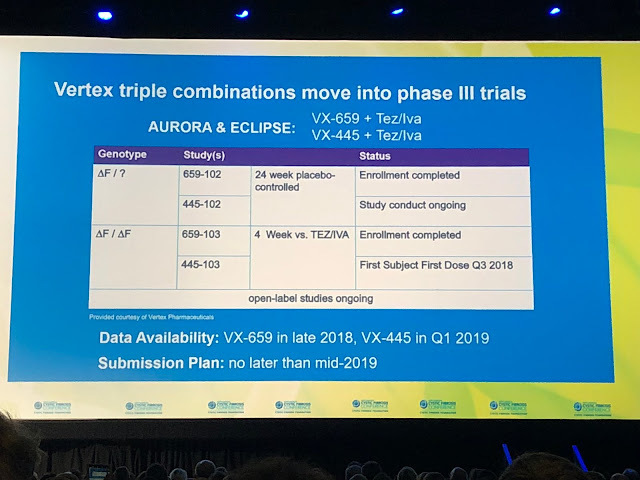 Data on the VX-445 trial should be in the first quarter of 2019. Vertex plans to submit approval no later than mid-2019. 2.) Vertex isn't the only company advancing a triple combo drug. 3.) 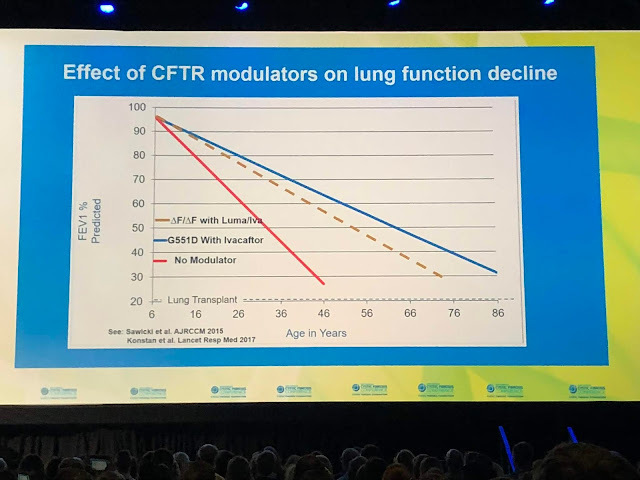 CFTR Modulators are good. But they aren't gonna make lung decline go away entirely. We know that lung decline is still an issue for those who are currently benefitting from CFTR modulators. 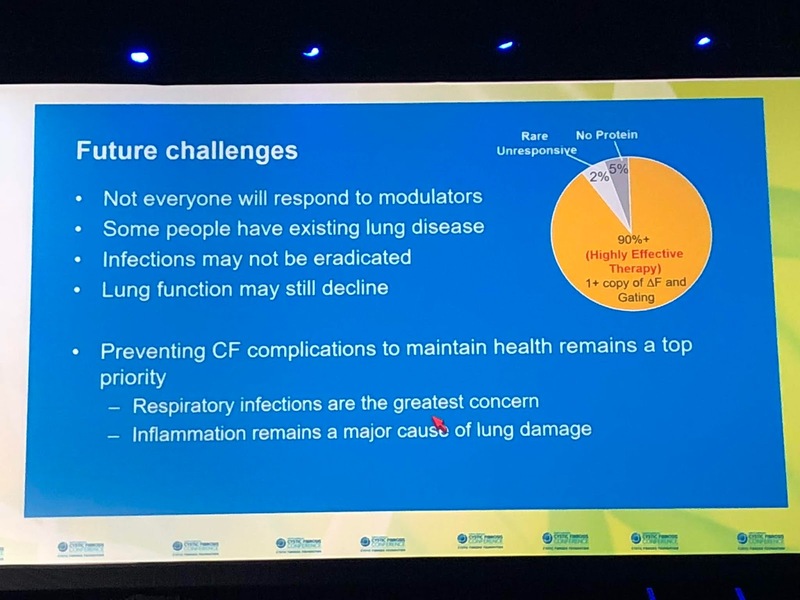 So, our community, even with modulators, needs to keep focused on keeping CF lungs healthy. This slide, which shows evidence of Ivacaftor treatment and stopping Ivacaftor treatment, reminded me both how much I'm grateful for the CFTR modulators and how they are still not a cure. This slide is a reminder that, CFTR modulators on the market or not, we still have a lot of reasons why we need to better understand respiratory infections and inflammation. 4.) The CFF is putting $100 million dollars towards an infection research initiative because we have so much more to learn about infection diagnosis, treatment and outcomes. 5.) Inflammation remains a major cause for lung damage. There are new anti-inflammatory drugs in the pipeline. There are new mucociliary clearance drugs also in the pipeline. Maren talked about the general healthcare ecosystem, calling this slide a "map" of sorts. Notice patients, professionals and the healthcare system overlap but all work towards health outcomes. This was one of my favorite slides. It demonstrates the relationship between the patient and the clinician. Many times I've heard clinicians explain their interactions with patients as the first image ("communications"). Even at NACFC there was conversation about "educating" the patient and how the patient needed to be further "educated." But, the place where coproduction actually exists is within the last image of "partnering." It is here that the clinician is no longer in the center of or more important to the relationship. 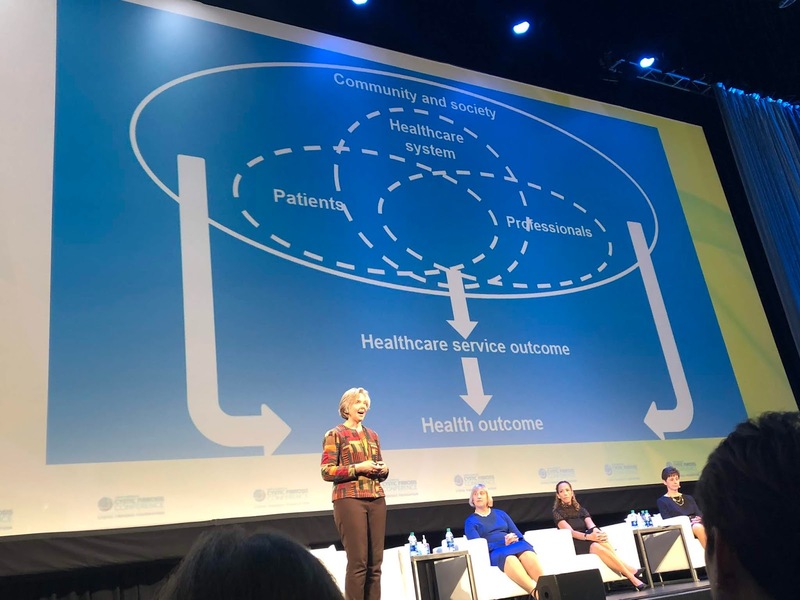 In partnering/coproduction, the patient and the clinician are equal. Here they give and take equally. This is the place where decision-making works best, as both parties respect each other's expertise. 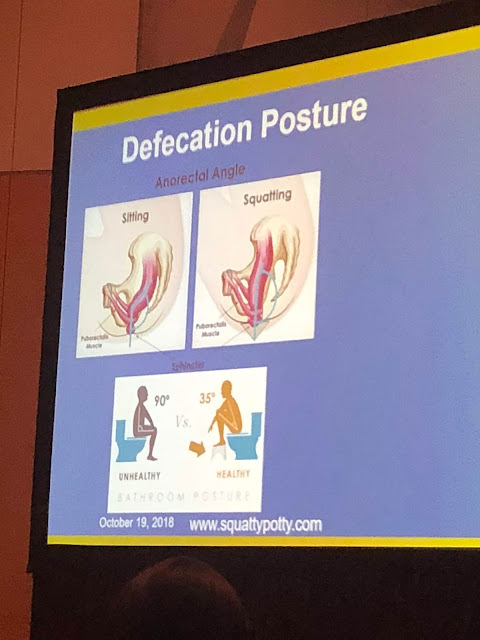 This slide was really great. It was the results from the CFF Mind of the Community Survey given last year. 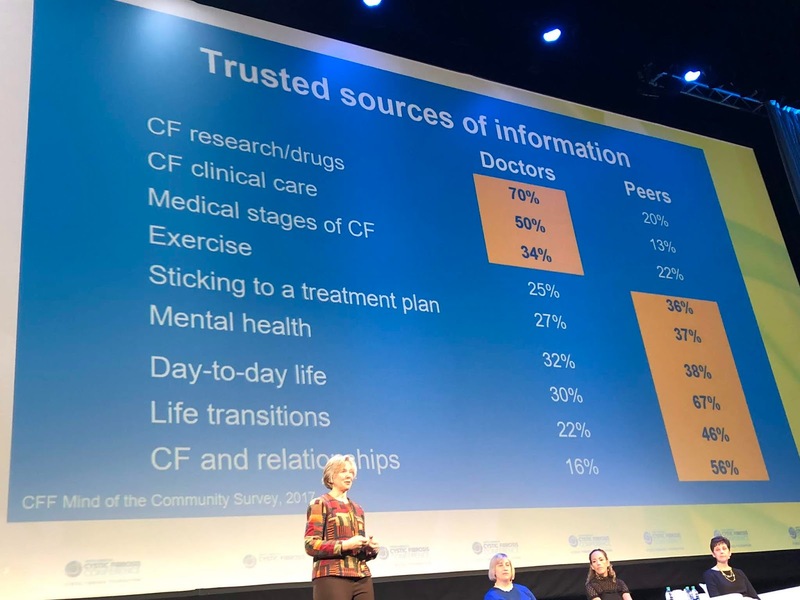 It shows that while patients do tend to primarily trust their doctors with regard to CF research/drugs (70%), clinical care (50%) and medical stages of CF (34%), they actually trusted their peers primarily when it came to sticking to a treatment plan (37%), day-to-day life (67%) and CF and relationships (56%). It's clear that in many important areas people/families with CF trust people/families with CF more than their often-central care team. For this reason, we must treat CF differently than we have in the past. 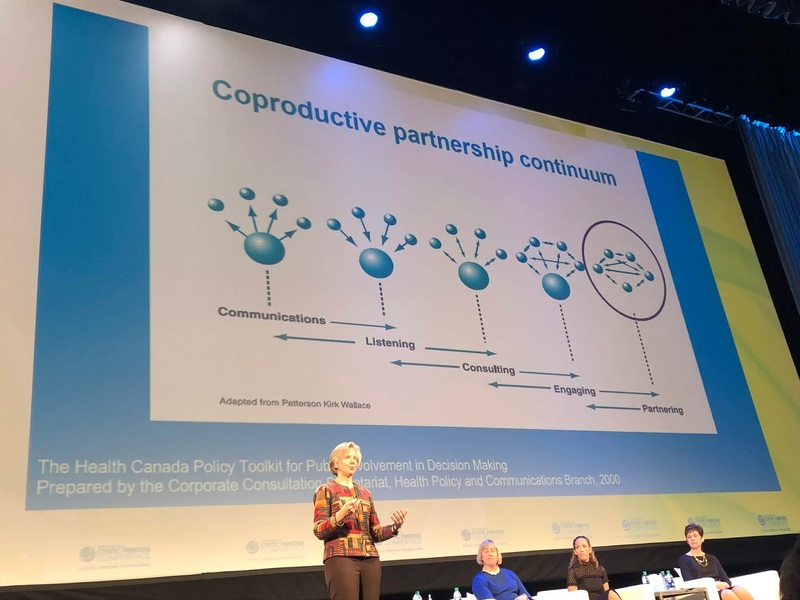 We can no longer have a one-way communication relationship, it must be partnership - it must be coproduction. 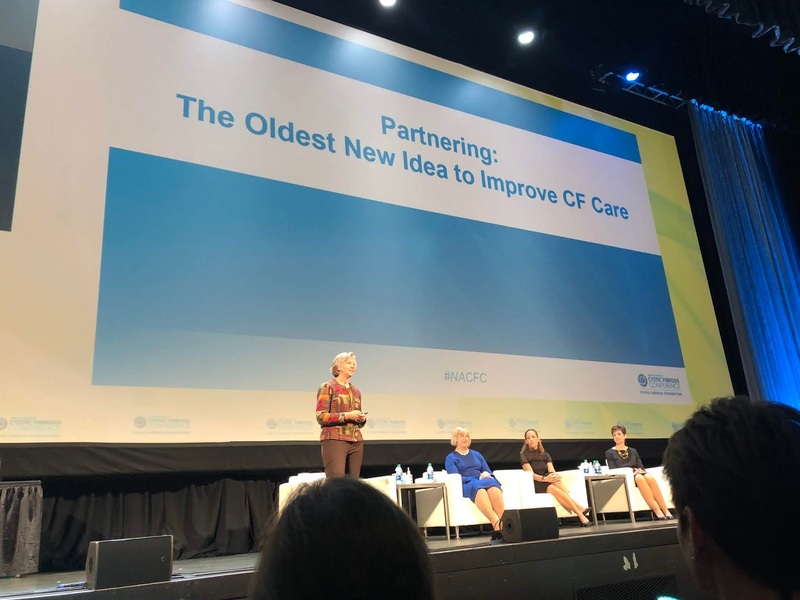 Alongside Kathy Sabadosa (a CF Mom) and Melanie Abdelnour (a person with CF), Cindy George (CFF's Senior Director of Patient Engagement shared about the partnership experience from the CFF's point of view. Cindy mentioned that the CFF is putting resources toward improving coproduction, most specifically within the CFF's mental health initiative, with the addition of CF resources and guidelines, by way of the Success with Therapies Research Consortium and through the Quality Improvement Learning Networks such as the CF Learning Network. 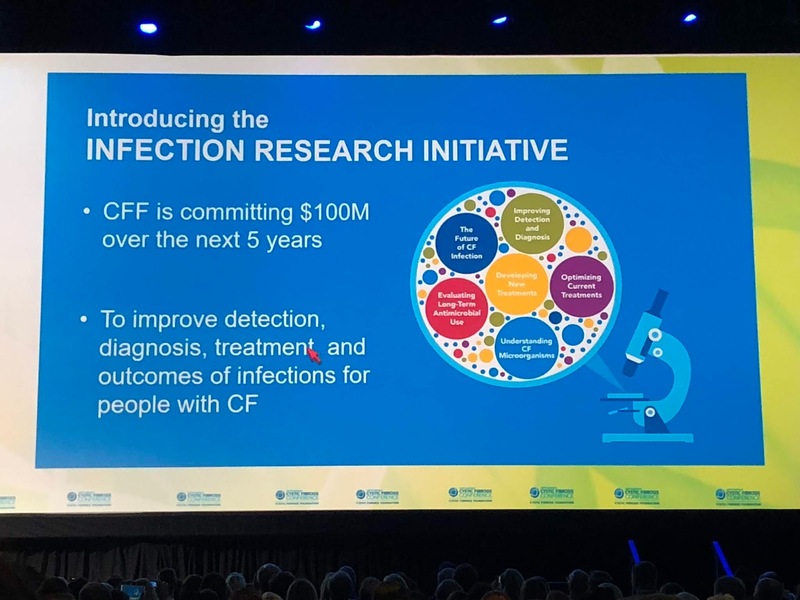 I can personally attest that the CFF is putting more resources towards building better partnership with patients and their clinicians in order to improve CF care. This new focus from the CF Foundation has supported the work I've been a part of with the CF Learning Network (CFLN) for three years now. 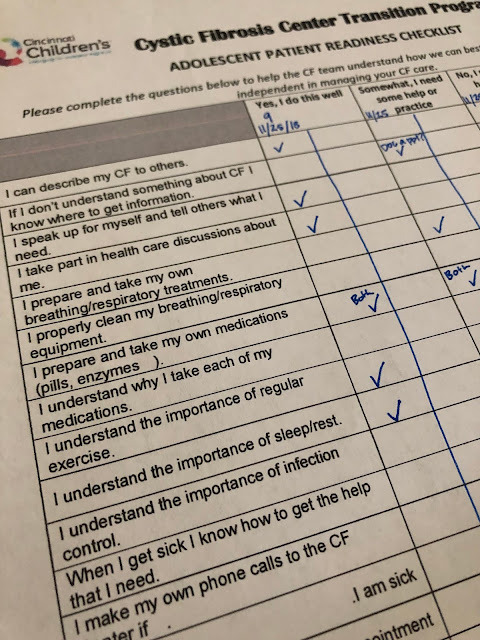 In particular, over the last year, I have been working within the CFLN to improve CF Center-level coproduction. If coproduction is patients and clinicians working together as equals, then "center-level coproduction" is when a group of patients and a group of clinicians work together as a team to improve CF care at the CF Center level (such as improving the wait time in the clinic, beefing up infection control, improving the clinic's communication system, etc). 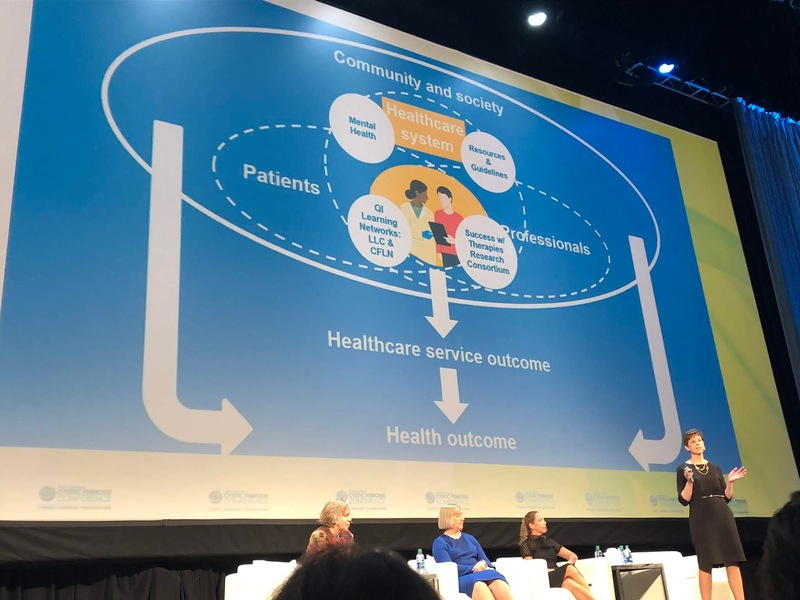 "Individual-level coproduction" is what we refer to as partnership between a individual clinician and a individual patient at point of care/within the clinic room, which is also very important. But I have been working more directly in center-level coproduction. This year, I took the research I have had the privilege to gather through the CFLN and submitted it as a poster which was accepted at NACFC 2018. It was then accepted as a presentation at the "Quality Improvement Thematic Poster Session." 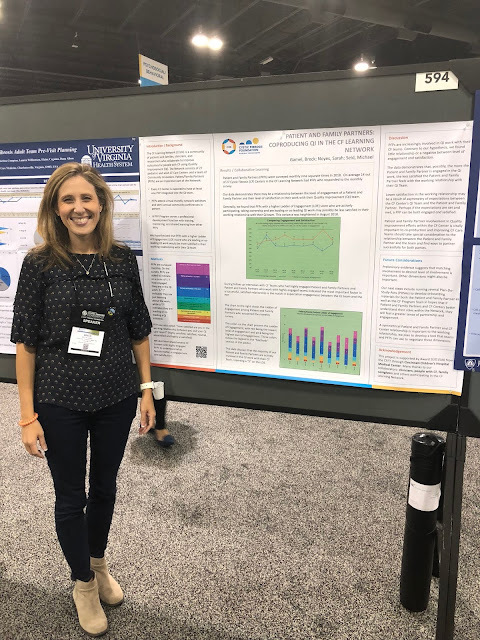 It was really rewarding to be able to teach others about the good work happening within the CF Learning Network through our participating CF quality improvement teams at 27 CF Programs across the US. 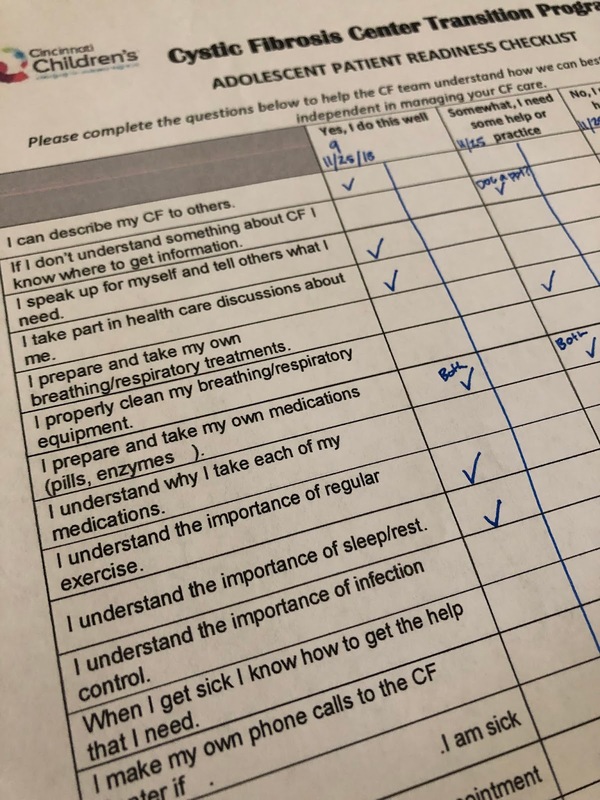 I am really hopeful that next year I can work with more of our patient and family members within the CF Learning Network to submit their own posters. We need more people with CF and their family members presenting research at NACFC. I fully believe that, as patients - members of the clinical team, we know a lot about CF and we should be demonstrating that knowledge alongside researchers at NACFC. 7.) There's a company working towards PERT-free food. What if you could offer your kid a snack without the need for enzymes? That's what the gang at GlycosBio are working on. It's a very interesting concept. 8.) 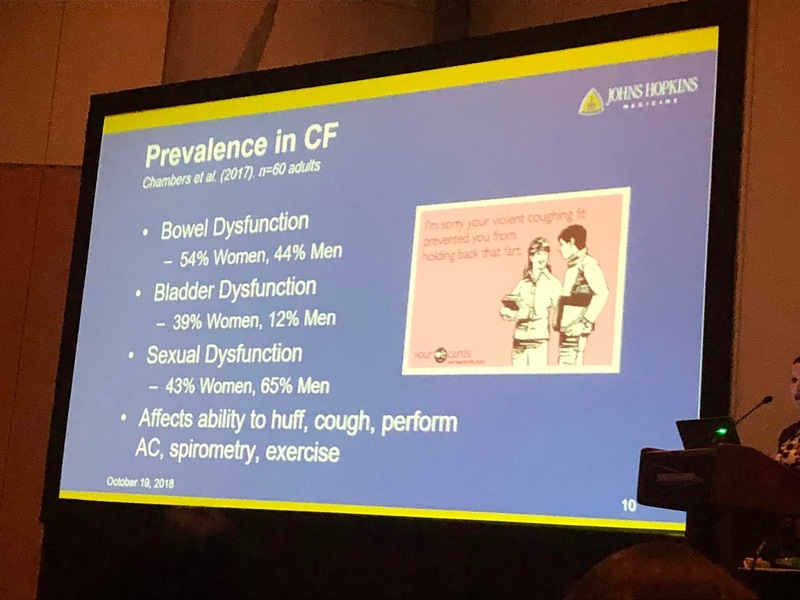 Bowel, bladder and sexual dysfunction is not uncommon in CF. Better posture and strengthening core and pelvic muscles may help. 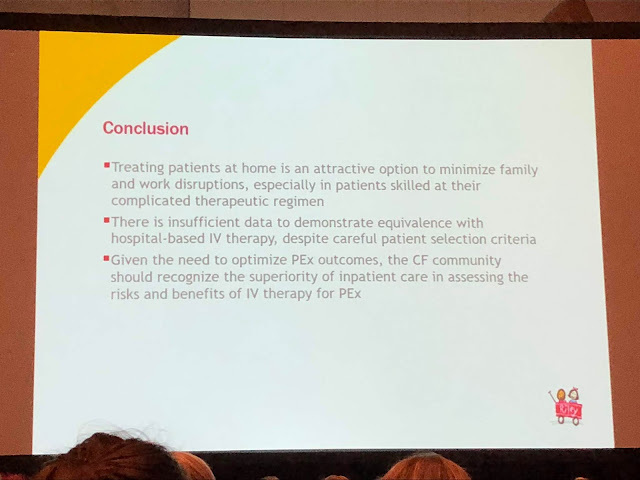 Physical therapists are being used more and more CF care. There are common issues prevalent in CF that might benefit from work with a physical therapist. For example, bowel and sexual dysfunction is common in CF. This is what it looks like for your diaphragm and pelvic floor when you cough. 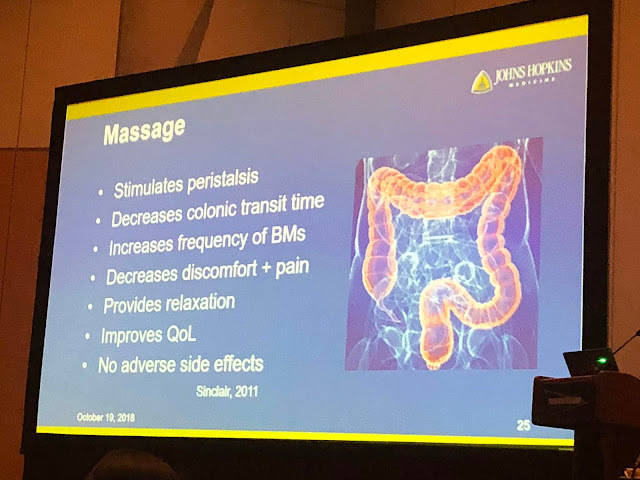 This is why for many there is loss of bladder and bowel control, the muscles may be trying to do their job but the pressure from coughing can be too much. 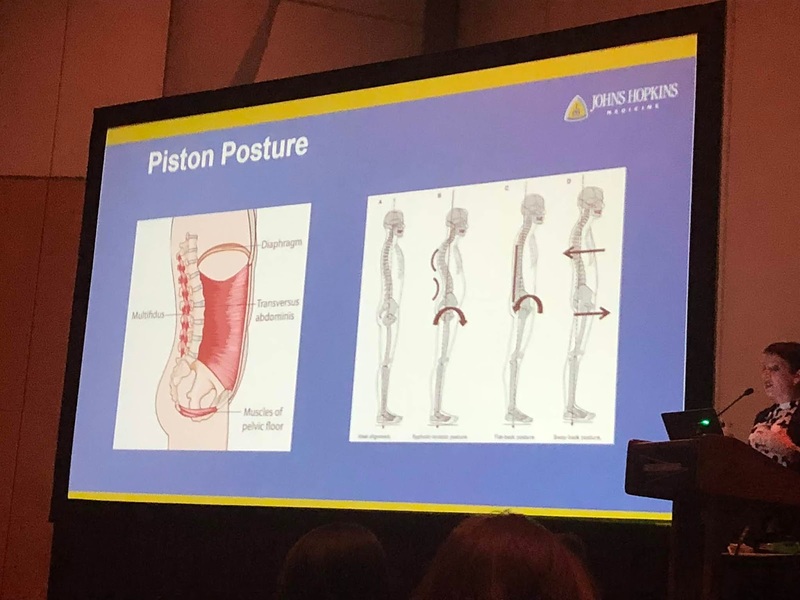 Physical therapist Karen Von Berg explained that building good posture and core muscles may help with the stress the muscles often find themselves under due to CF's effect on the body. 9.) One way to address DIOS in CF may be massage of the abdomen. 10.) There is still a lot we don't yet know about pulmonary exacerbations. 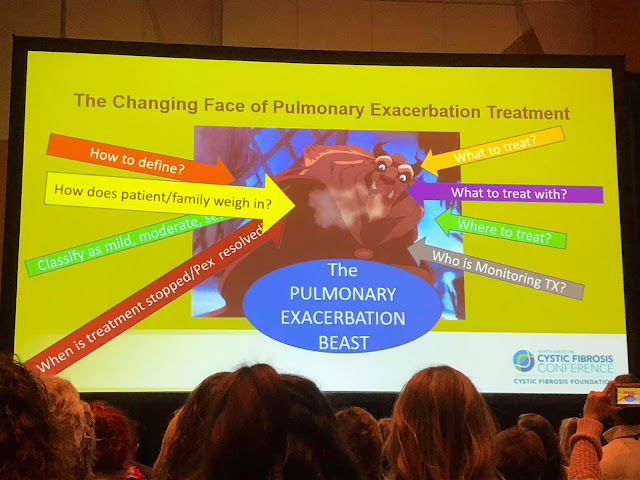 How do we define a "pulmonary exacerbation?" Doctors don't agree. What do we treat it with? What do we use to treat? Where should we treat it? Who should monitor treatment? When is treatment stopped and when is the pulmonary exacerbation resolved? How do we classify it as mild, moderate or severe? How does the patient/family weight in? These are just some of the questions doctors and researchers are trying to answer. 11.) There is debate within the clinician community on whether IV antibiotics should be given at home vs. in the hospital. Before I share more, I must outline what the debate between two really great CF doctors was about. 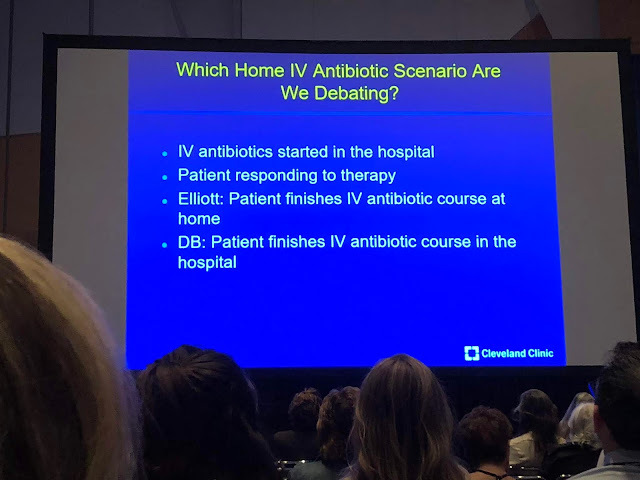 They debated whether research points us to believe IV antibiotics (once started in the hospital and proven to be effective for an individual patient) should be continued at home vs. in the hospital. The debate was convincing on both sides. It seems that the issue is very patient dependent and results, positive or negative, can due to a complexity of things. Data may tend towards telling us that FEV1 results seem to improve better if you finish a course of IV antibiotics in the hospital. But we know that FEV1 is just one measure of someone's overall health in CF. Data also tends towards telling us that quality of life may improve when a course of IV antibiotics are given at home. 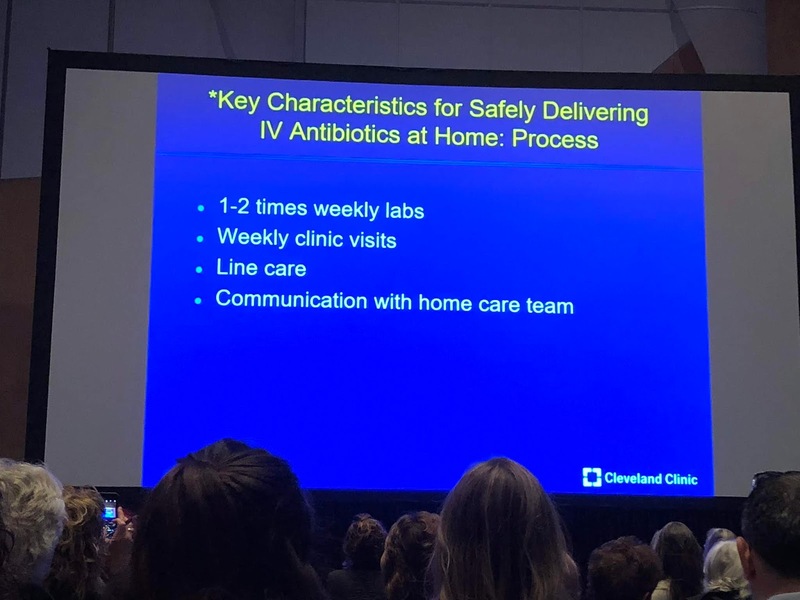 What I came away with for my own family was that IV Antibiotics can be given at home but need to include, at minimum, 1-2 weekly labs, weekly clinic visits, PICC line care and good communication with the home care team. The conclusion of the debate brought about a few important points both doctors agree on. Both doctors agree that the CF community needs to be more aggressive with treatment of exacerbations. 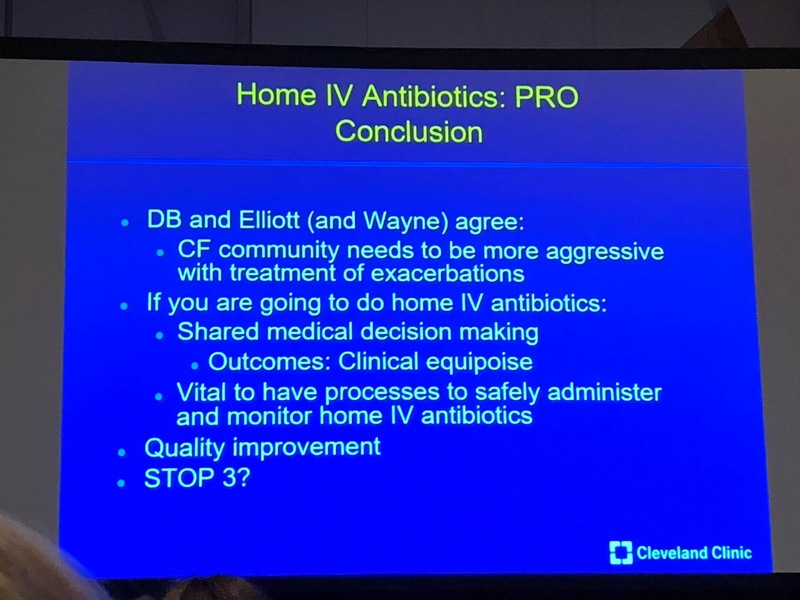 And, if IV antibiotics are to be given at home, there should be shared decision making (partnering between the clinicial team and the patient) and good processes for administering and monitoring. 12.) Respiratory virus infections, including RSV and Influenza A, may promote P. aeruginosa biofilm growth which transitions to chronic infection. This slide shows the the presence of RSV (which is one of the cold viruses) has a correlation with more PA (bacteria in green). But, scientists have been trying to figure out why. 13.) Microbial ecology (how bacteria, viruses, etc. interact with each other) is important in CF and shouldn't be ignored. In the session called, "Mucin as a Nutrient Source for Staphylococcus Aureus Invitro & In CF Associated Chronic Rhinosinusitis," it was presented that, in general, pathology (or CF disease) is determined as much by the conditions of the environment inside the lungs as by the presence of a pathogen (bad bacteria/virus, etc). In other words how sick with CF you are is probably less about whether you have a bad bacteria in your lungs or sinuses but it's more about the interaction of that bacteria with other bacteria. (As Brian explained it to me: it's not whether Johnny is a bad kid or a good kid, it's whether Johnny is a bad kid when he gets around the bad kids at school). As demonstrated on this slide, the healthy lung environment (left side) has plenty of oxygen (O2) and normal food (GLc/glucose). But when there's a viral infection (such as an infection in the sinuses, also called "rhinosinusitis"), oxygen levels (O2) fall and nitric oxide levels (NO) rise and lactate replaces glucose (GLc). It is here, in this new environment that bacteria that was harmless suddenly becomes disease-causing. 14.) 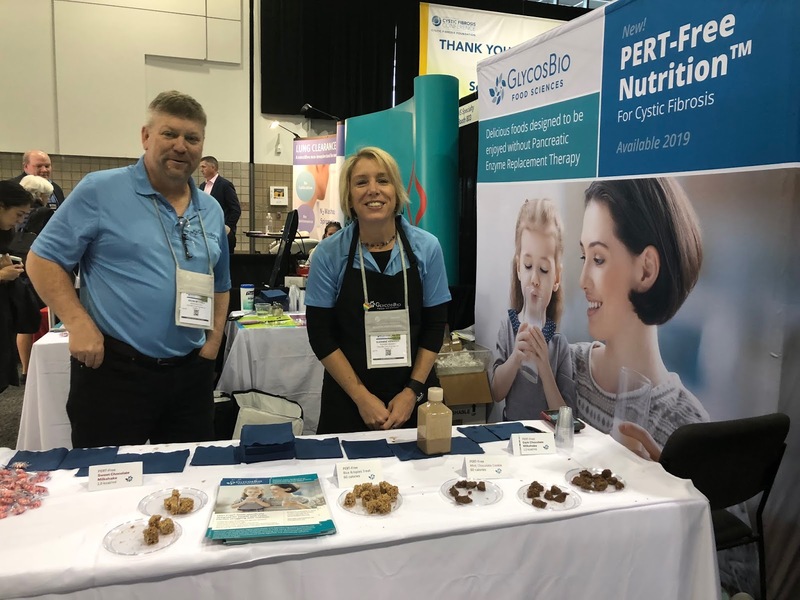 Nutrition options in the CF world continues to expand. 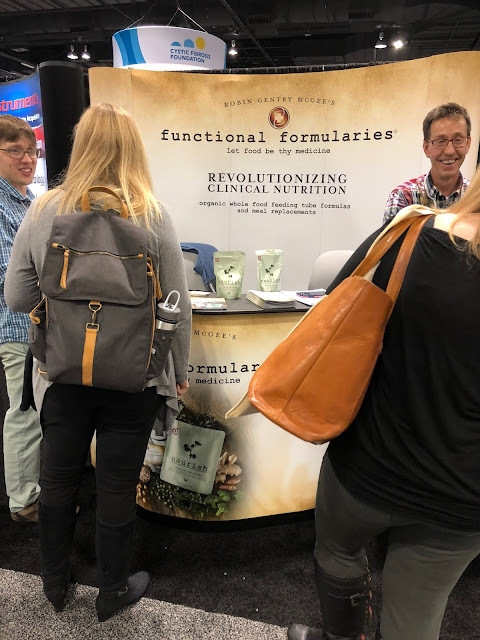 A few years ago, I learned about Kate Farms at NACFC. 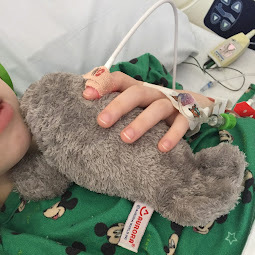 We love Kate Farms feeding tube formula at my house and use it nearly every day. Now, there is another company on the market called "Functional Formularies" which offers organic, whole-food feeding tube formulas and whole meal replacements. 15.) 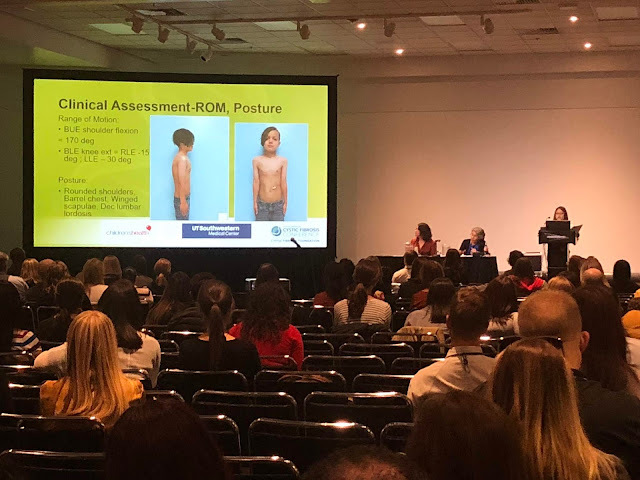 Physical therapists are being added to many CF teams and they are doing great things with PT. 16. 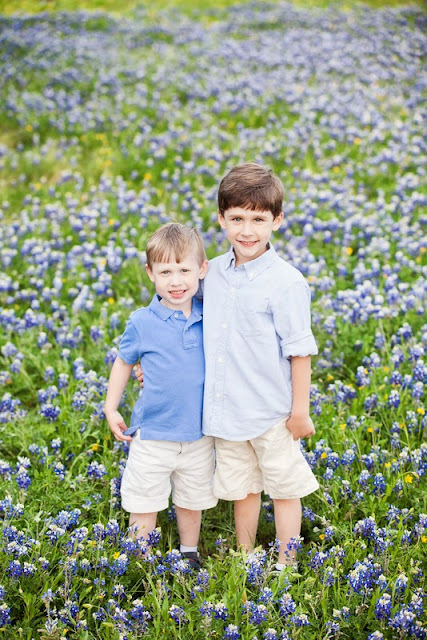 There's a new a college scholarship opportunity for siblings of people with CF through Vertex. 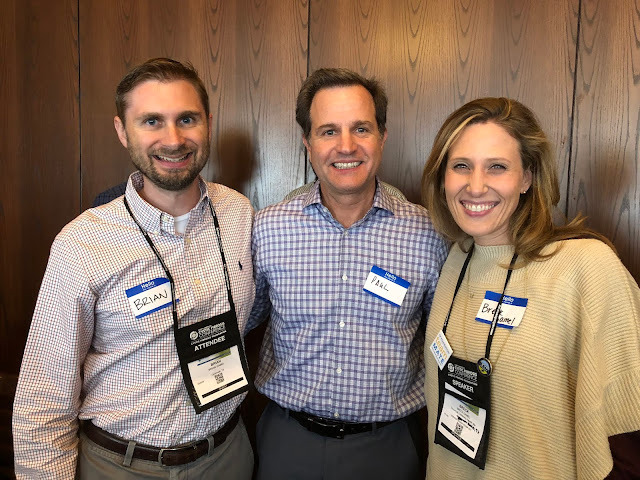 Speaking of Vertex, Brian and had an opportunity to meet Paul Negulescu from Vertex at NACFC. I asked Paul if he would take a picture with Brian and me as we wanted to show the picture to Bennett when we returned home. I always tell Bennett when I go to NACFC that "I am going to meet with the doctors and scientists trying to find a cure for CF." Now that a med that may actually benefit Bennett is likely to be out in the next year or so, I decided to show Bennett the picture of the person who helped create it. We don't know what the future will hold for Bennett but it feels really great to know there are a lot of people like Paul out there trying to find a cure for cystic fibrosis.